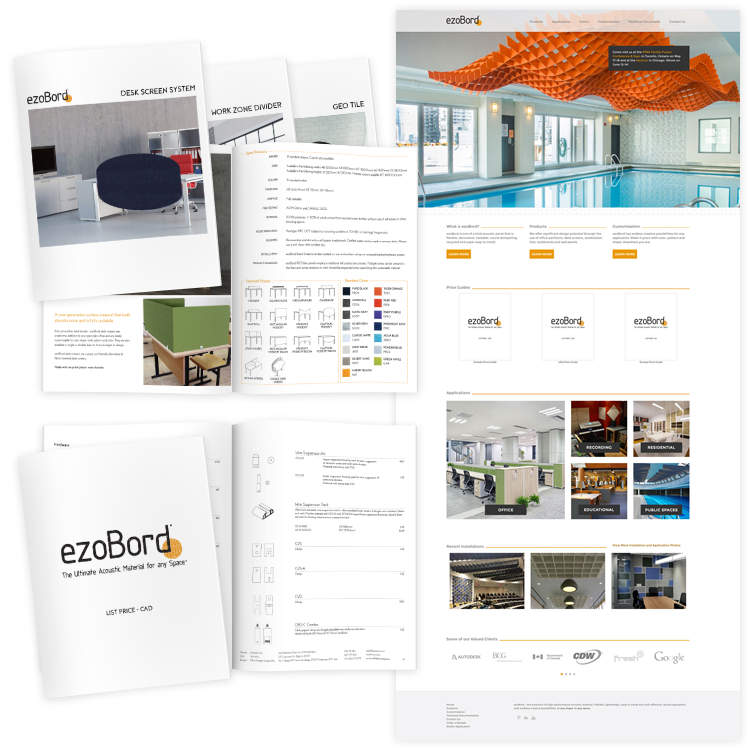 The client, ezoBord, is a brand of highly acoustic and tackable product that can be used in offices, educational venues, public spaces and other open concept areas to help dampen sound. One of the first products of it’s kind, the client quickly found that it’s competition was overtaking them in the marketplace. When some of the client’s potential customers told them that their marketing materials weren’t on par with what what their competition was using, the client recognized they needed to pull in a team that specializes in graphic and web design. The client had a large selection of content already in existence that we could begin with and provide the polish that they needed. We started with a full comparison of the client to the competition, determined what the competition was doing well, and where we could help the client set themselves apart and really showcase their products. Our next step was to take what the client already had, which consisted of a lot of good content, and give it a clean and consistent look and feel that would really communicate with the client’s target market. We applied this both to the website and printed collateral. We also worked with the client to improve how their target market could reach out to them for more information and to request samples. Since working with us, the client has also moved into a new market, and required additional collateral specifically for that market. As the client continues to create new products and new initiatives, we work closely with them to create marketing pieces that maintain the brand image and stand out. For the following 7 months after MoonSoar Services started working on the ezoBord website, the company saw 136%more form submissions over the previous 7 month period. The website also saw the average session duration increase over 500%, pages viewed per session increase by 25%, and average time on page increase by almost 300%. What this meant for the client was that more people were spending more time on the website before contacting the client for more information on their products.